We absolutely love “What’s in the Bible” at our house. My boys and I actually appear on volume 7 (We’re in the bonus features – true story!). They’re offering a sale of up to 60% off retail, but only for 17 hours. The offer ends at 11 AM EST on 11/8! They are are also offering free shipping on all orders over $25, so if you order 4 DVDs for $25 you’ll also get free shipping! We love that they make learning about the Bible fun and entertaining. As a mom, I love that they’re teaching deep truths in a way that even young children can understand and relate to. They’re funny and enjoyable to watch. 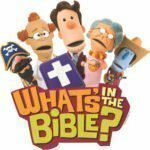 If you’ve ever wanted to teach your kids more about the Bible, but you’re not sure where to begin, These DVDs are a terrific resource! I majored in Christian Studies at my University, and I still learned new things watching the videos. Until 11 AM you can get the entire 13 DVD series for only $66.57 (normally $179.88) plus free shipping. Seriously. I’ve never seen them offered at that price before. There are a ton of great DVDs to choose from! I’m getting a few as stocking stuffers for my boys. 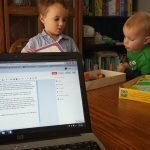 This post contains affiliate links to What’s in the Bible. We hope you love them as much as we do!